In last month’s Virginia Gubernatorial debate the media proclaimed a clear winner…the guy who wasn’t even there. After Libertarian candidate Robert Sarvis was shutout of the debate, the campaign created a 30 second ad and paid for it to be broadcast during the debate. The “Open-minded and Open For Business” ad hit home not only with the viewers, but also with the media. If you haven’t seen it, Click Here to watch it. The media, in typical fashion, had been mostly dismissive of the young looking Libertarian. But after the Democrat and Republican used their time to bash each other on stage, the media was reminded that there is a better option. Now, they are giving Sarvis equal footing and plenty of coverage. Sarvis has been doing interviews around the state everyday…all day. 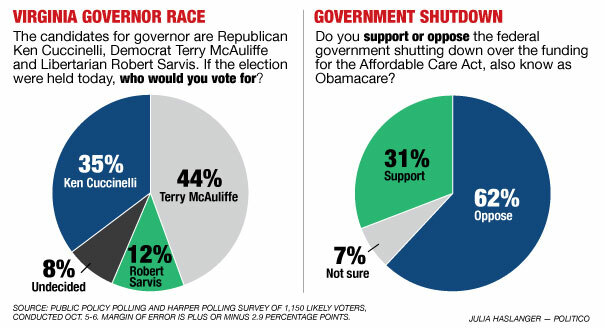 The commercial and the media coverage have helped propel Sarvis to a head turning 12% in the polls. In some counties Sarvis is polling in the high 20′s! That’s in a race where the other two candidates are spending millions of dollars a week in radio and TV ads. And we’re not talking about some half-baked internal polling. These numbers are coming from the big boys – CNN, Politico and others. Click on the image above to read the full Politico story. There will be one last debate in Virginia and the organizers will decide tomorrow if, in their opinion, Sarvis has met the threshold to be included in it. Sarvis has already met at least two of the requirements 1) Be on the ballot 2) get at least 10% in recognized polls. The third key area of focus is direct public support of the campaign. To show they have the direct support of the public, and to fund a statewide airing of the “Open-Minds and open for business” ad, the Sarvis campaign has launched a $10,000 on 10/10 fundraiser. As this email is going out, the campaign fundraiser has already raised over $8,000! Let’s help push them far over the top – Donate Here Today! You can also join Robert Sarvis for Governor online at www.RobertSarvis.com and on Facebook, Twitter and YouTube. PS, the Libertarian National Campaign Committee has been a proud supporter of the Robert Sarvis for Governor campaign since day one. They have shown, throughout the campaign, that the team is serious and dedicated not only to achieving ballot access for the Virginia Libertarian Party, but also to building a positive image of the party in the hearts and minds of Virginia voters. I encourage you to help support this groundbreaking campaign!